﻿ Chicago Hispanic Newspaper, Lawndale News, Hispanic Bilingual Newspapers, Su Noticiero Bilingue » What if Yongbyon Goes Boom? April 18, 2019 8:06 pm You are here:Home Commentary What if Yongbyon Goes Boom? What if Yongbyon Goes Boom? Posted by on September 26, 2013 in Commentary | Comments Off on What if Yongbyon Goes Boom? Interestingly enough, the Russian government is warning not only North Korea but China and other countries in northeast Asia about the Yongbyon nuclear reactor in North Korea. Before the reactor was converted into a place to manufacture plutonium for making nuclear weapons, it had been in use since 1965 as a power plant supplying electricity for the northern part of the country. In the 1990’s, it was used as a breeder reactor for plutonium for making atomic weapons (eventually the North Korean government shut the reactor down after making a few A-bombs). The place has been a source of contention with North Korea on the one hand and its neighbors and the United States on the other. In an ironic twist, the North Korean government stated that it will restart the Yongbyon nuclear power plant to make more plutonium for nuclear weapons. This alone is not why the Russian government has warned about Yongbyon. The main reason why Russia is concerned about Yongbyon is because of its age. The nuclear power plant is based on old technology from the era of the Soviet Union. The technology is Soviet technology from the 1960’s, and Lord knows how far backward that technology is. It was similar technology that was used at the nuclear power plant in Chernobyl in the Ukraine—with extremely disastrous results. The Russians are worried about a major accident that could easily turn into a disaster. If there is a nuclear meltdown at Yongbyon, it would not only affect North Korea but also South Korea, China and, you guessed it, Russia. So yes, the Russians are quite worried about Yongbyon. With the age of the reactor and its facilities, it is possible that the North Koreans may be sacrificing safety for making nuclear weaponry. 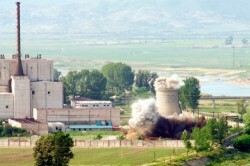 This is nothing new with North Korea, but the danger of a possible nuclear meltdown is growing. Like the Chinese government, the Russians are not as concerned about North Korea producing nuclear weapons. However, nuclear radiation and fallout does have them worried. Frankly, it should have the whole world worried.